Caravan (Hebrew: קראוואן‎; pl. קראוואנים, caravanim) is an Israeli term referring to a portable building used as a living space, school classroom, synagogue, or community center. Caravanim are constructed of aluminum or other metal siding with a corrugated metal roof, and are often attached to a cement-block base. They are not insulated but can be outfitted with heating and air-conditioning units, water lines, recessed lighting, and floor tiling to function in a full-service capacity. 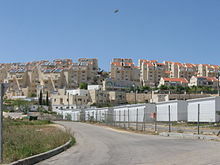 The establishment of caravanim on disputed land by Jewish activists is considered the first step toward the establishment of an Israeli settlement. In its initial stage of a few caravanim, the establishment is called an "outpost." As more settlers move in, the establishment is upgraded to a "settlement". Alternately, caravanim have been established on disputed land by Israeli and Palestinian activists as a sign of protest. School in caravanim (lower right) on the perimeter of Tel Zion, a Haredi settlement in the West Bank. 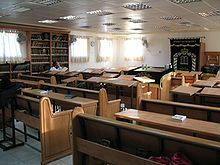 Interior of a synagogue housed in a caravan in Neve Yaakov, Jerusalem. Caravanim are popularly employed by schools — especially in Haredi neighborhoods of Israel — that are unable to finance a permanent structure. A 2008 report by the State Comptroller of Israel reported that 125 out of 186 Haredi schools in Bnei Brak, Elad and Modi'in Illit were situated wholly or partially in caravanim, some older than 15 years. The report criticized these structures for lack of ventilation, lack of bomb shelters, and lack of proper yards or playgrounds for the children. Though the construction of some caravan schools violate local planning and building laws, the government does not dismantle them. Many start-up religious congregations establish their synagogues in caravanim rather than the more expensive permanent concrete-and-stone structures. Synagogues housed in caravanim are common sights at Israel army bases. Caravanim are sometimes used as inexpensive houses in new or extensions of existing localities within Israel. Most often, caravanim are employed by both settlers and the government as housing in Israeli settlement areas in the territories occupied since 1967. 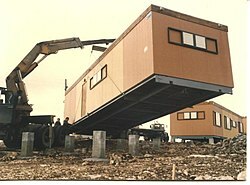 Residents usually live in caravanim until permanent homes are built. The caravan may also be a more permanent low-rent option, particularly for young couples. The overnight installment of caravanim for housing is a popular means of establishing a new, unauthorized settler outpost on disputed land. 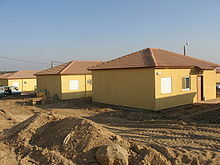 In 2005 prefabricated homes, named caravillas (Hebrew: קרווילה‎), a portmanteau of the words caravan and villa, were set up to house the Jewish families evicted from their homes in Gush Katif in the Gaza Strip as part of Israel's unilateral disengagement plan. A caravilla is composed of several prefabricated sections that are joined on a foundation. Caravillas, which vary in size from about 650 to 1,000 square feet, are akin to the Israeli concept of a villa, or single-family home. They were instrumental in pacifying objections to the disengagement plan. The biggest of these caravilla camps was established in Nitzan, north of Ashkelon with 250 caravillas, which has grown to accommodate over 500. ^ Rappaport, Meron (21 December 2005). "IDF completes evacuation of Bil'in 'outpost'. Some 150 troops break into caravan built near West Bank village to protest construction of separation fence". Haaretz. Retrieved December 26, 2010. ^ HaLevi, Ezra (21 September 2005). "Arabs Establish Outpost on Hevron's Ancient Jewish Cemetery". Israel News. Retrieved December 26, 2010. ^ Hai, Yigal (11 February 2008). "Comptroller report: Schools in Haredi, Arab sectors dilapidated. Classroom shortage has forced local authorities to cram students into hazardous temporary structures". Haaretz. Retrieved 19 November 2010. ^ Dadon, Tova (22 November 2010). "Haredim staging Kiryat Gat takeover?". Ynet News. Retrieved December 25, 2010. ^ Fischel, Marion (19 June 2005). "Synagogue Review: Hippies in Suits". The Jerusalem Post. Retrieved December 25, 2010. ^ "Out of the Desert". realtravel.com. 23 March 2008. Archived from the original on December 1, 2010. Retrieved December 25, 2010. ^ Ireland-Cooperman, Sara (18 March 2009). "Settlers In Caravans". The Jewish Press. Retrieved December 26, 2010. ^ "Welcome to Tekoa". Gush Etzion Foundation. Archived from the original on 2010-12-29. Retrieved December 25, 2010. ^ Izenberg, Dan (1 January 2008). "Settlers Erect Two Caravans Near Bil'in". The Jerusalem Post. ^ Weiss, Efrat (11 July 2007). "Peace Now: Settlers smuggling caravans to territories; Group issues report showing that settlers bypassing ban on moving caravans to West Bank by assembling them on site". Israel News. Retrieved November 19, 2010. ^ Arfa, Orit (September 21, 2010). "A Perpetual Sukkah: As Sukkot approaches, most Gaza evacuees still live in temporary housing". The Jewish Journal of Greater Los Angeles. Retrieved November 19, 2010. Wikimedia Commons has media related to Caravans in Israel.